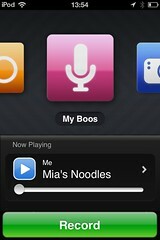 IF I HAD a speech-to-text conversion running on my Audioboo account, our four year old would have a full-fledged blog. As it is, she already knows how to find the purple Audioboo icon on the iPod Touch and the Motorola Xoom and she has shown her after-school activities co-ordinator how to use the program. In some parts of the Audioboo community, that makes her an audio blogger. She's already part of a playlist. I think Mia's ease of audio journaling marks an important evolution of blogging. As the vloggers have said all along, blogging isn't just for texters. Syndicated story-telling across audio channels also deserves to be given full recognition as part of the blogging movement. But it is probably too emergent a communications channel to be noticed by web awards organizers. There's real empowerment in having a self-confident manner when talking. I think the casual and reflective Audioboos created by Mia go a long way to helping her form a self-concept that will manifest itself in very positive ways as she continues growing in Big School. Podcasting doesn't get enough respect.